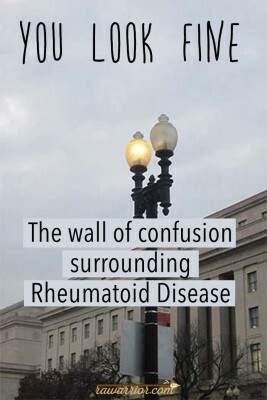 Confusion surrounding rheumatoid disease is like a wall between those who have and those who have not – the disease. Where does this come from and what can be done? Now is the time when I will actually do what you thought I did already: be transparent when it is uncomfortable. When I first got sick, I used to try to explain why I could not do things anymore. But people did not understand because they do not know about RA. People who knew me before I was sick did remember how I had been so agile and strong. However, nobody here knew me – since I moved here right before I got sick. Sometimes, I was hurt as much from reactions to Rheumatoid Arthritis as from the RA itself. Reactions I have received include cold silence, changing the subject, comparing Rheumatoid Arthritis to a hangnail, and laughing out loud, “Yeah, right, like you are old enough for arthritis!” I was encouraged to get over it. Out of self-preservation, people with the disease naturally stop discussing it with others. Who wants to be insulted and dismissed? While they’re suffering the worst pain and weakness of their lives? Not me. Of course, the blame for the wall lies with Rheumatoid disease itself for being mysterious, invisible, and surreptitious. After about four years of writing about it, reading research and talking to patients and researchers, I believe it is the most maligned and misunderstood condition. And the tremendous irony is that the disease is not rare. Taking the wall down TOGETHER is doable! Since I was very young, I think while I’m writing. And that’s what happened that day, May 20th 2009. I wrote out my approach to transcending The Wall, my goals for this site. You can read more about that on the RAW About page or in that original post. POSTBLOG: In the past couple of years, I have seen those goals written elsewhere on other sites. I hope you know they came from my heart when I wrote them and if you see them on other sites, they were “borrowed” without my blessing. IMPORTANT: The poll is a short survey and you’ll need to complete it all at once because it will only record one entry from you. If you do NOT have Rheumatoid disease, please send this link to any Rheumatoid patient you know. Latest edition of The SPEAR newsletter went out yesterday! Check your email box or sign up to get yours HERE! Ha! I was just thinking this morning that my hair and make up is a gauge as to how I am feeling on any particular day. Some days (1 or more) I don’t wash my hair. Some days I wash but just sit in a chair, turn my head upside down and blowdry my hair. Then on good days I actually style my hair – but even still nothing like I used to. And on really really bad days – I don’t shower at all, pull my hair into a pony tail, no make up, and have an I dont care how I look attitude. it just becomes unimportant. rawarrior …I may look fine, but I’m not! i find it odd, that when i told family i had seronegetive ra, some family members respone was “oh, i have/had that for years”. My response was “what meds are you on?”. their response was mostly Ibuprophen. they don’t seem to understand how tired this illness makes me feel everyday. One of the things that I’ve learned about having RA is that no one among your family and friends wants to hear about it. If you complain about your pain they think you’re a hypochondriac. I’ve learned to save my complaining for the Rheumatologist. I’ve been lucky that the last two that I’ve had have been caring and understanding. They’ve understood what this disease is really like and listened to the patient. I wish that I could get out there and talk about RA and let people know the reality. I just feel that I would never be listened to. I can relate to your experience, Catharine. I was surprised and hurt by the reactions (or lack thereof) of friends and family to my diagnoses of RA and Sjogrens. “Oh, I have Arthur-itis too – everyone at your age does.” Nobody asked me any questions about the difference between RA and OA, and weren’t the least bit interested in finding out. It was only when I mentioned that one of the Williams sisters of tennis fame has Sjogrens that anyone’s interest was piqued. So, I too save my “complaining” for my Rheumatologist. It’s a lonely disease on many levels. I suspect my new rheumy is one of those who discounts RA if the hands look “good”. I tried to tell him about all the other stuff wrong – he hadn’t looked at my patient information or taken a history from me – but he wants to confirm I really have RA. After 26 years, multiple joint replacements and surgeries, and countless specialists, I’m pretty sure, especially since I have a “textbook” case of severe RA per several past rheumys. But now we get to repeat all the tests to rule out fibromyalgia and chronic pain (as in nerve sensitivity, not pain from orthopedic damage or from severe flares). I am so disgusted right now. Funny that you should do this post today. I just got the old “But you are so thin and pretty no one would ever know you are sick” for the umpteenth time. What does appearance have to do with anything? This was while I was streching my damaged hip, before I got in the pool for my no impact, adapted workout. What does sick look like anyway? Kelly…I filled out the survey but was not able to get it to process…It stalled and would not go through…I would have liked to see the responses for the question of how often everyone with this disease showers or takes a bath…I only do that two or three times a week…It completely drains my energy!!! And I only shave my legs once a month or so because it is so much work and then I need a nap afterwards…I know this is terrible in our society but I can’t do any better! Maybe you can try again on a different computer. In a few weeks, we’ll publish the results. That’s funny! I finally shaved my legs when they embaressed even me – alone! But it’s just such a chore! The Humira has made me feel so much better joint wise but still the fatigue and there are still joints that just won’t quit hurting. This could be as good as it gets. I wonder if part of the tired is depression from feeling so bad? Could be but if I weren’t so tired there is so much I would really like to do! That just doesn’t seem depressed to me. i have found that as a process of elimination, the folks i am surrounded by are very supportive. i have had to educate them and also let them see me at my worst to “impress” them – not my favorite choice! so over time, they have understood tha i could look fab (LOL) but feel like hell! in the survey, i wanted to say going down stairs is much more of an issue than going up! Did you answer it for going up or down? Yes, knees are much worse going down. Thank you for pointing out that for some of us going down stairs is very difficult. I find going down a staircase much more difficult than going up. yes good point – I do not “hold on” the way people normally would if they had knee problems since my hands/shoulders are as bad as legs/feet. Early on I developed a way to lean into things and not fall using my forearms to brace me. But it’s not the same is it? You’re so right. Oh, the “lean”…I know it well! LOL, I once left a red trail down the wall going downstairs in my house when I leaned a little to heavy in a brand new red shirt! I’m in the same boat: can’t hold on like a normal person because that would kill my hands and shoulders. What I find terribly discouraging at times is that because I don’t look sick, family and friends seem to actually FORGET that I have RA. And these are people that I know have been told. But if in conversation with them I say something about RA, they still look at me in shock and say “I didn’t know that”! Very very disheartening to say the least. Thanks so much for writing this post. I found it to be completely relatable. I recently started a blog, rararadlife.wordpress.com, and chose to write anonymously. The reason I felt it was a good idea was because I felt it would help me write more honestly and that future employers would not be be able to easily learn of my disease. My husband and I actually had a chat about it last night and I realized I chose to be anonymous is because part of me feels ashamed, unworthy, and that others may perceive me as being a whiner. Most people respond awkwardly or ignorantly so I have found myself not talking about RA and have used my blog as an outlet. Some family and friends have discovered my blog through me posting on facebook on RA related pages (such as yours) and Facebook shares it. Perhaps I could work up the courage to share my blog with more family and friends and bring down the wall of being anonymous. Thanks again for your post! I am at a curious spot. I had severe RA with all sorts of pain in all joints and coupled with exhaustion. I shot my self with Enbrel weekly for 3-4 years. For reasons which I don’t know I no longer have pain nor need Enbrel. I guess I’m lucky but I still have the exhaustion factor. I realize that being male means that i might have a better chance than women at gaining some relief. Whether all will return or not I am not sure. Oh, I also have the dry, itchy eye situation, so I feel that a “RA ghost” is still lurking about. My onset was one morning when every joint from my toe knuckles to my ear bones ached and I was immobile and unable to drive for a month until meds and diagnosis.Anyone else? Bob, I too have had pain in every joint, even ones like you say in the ears that you don’t really recognize you have! Whether meds work like they did for you or they don’t like for me, a remission can come. I’m so glad you have one or a near one actually – and I hope it lasts a long time! I pray every day for something like that. Either way a cure is needed since as you realize, the disease is lurking still. It was bothering me that I forgot to tell you how funny it was when you said “shot myself with Enbrel.” There. Now, I said it. People’s reactions to my RA have been one of the hardest things to deal with. The level of ignorance is amazing considering how common RA is. It feels like a conspiracy of ignorance on a bad day for me. If there was greater awareness about what RA is then my experience would be easier. Thank you again for your posts and for the survey. I did not fill it out because I’ve ‘only’ (the quote marks have a hint of sarcasm there!) been diagnosed with Sjogrens, with either very much normal, slightly higher RA factor or normal bloodwork completely (i’ve finally had a slight ESR elevation=proof!). I had no idea how painful Sjogrens really is and so still believe there is more to it. Either way, it is invisible and paralyzing. Your website keeps me going. Thank you. BTW, it took me almost three years to get the Sjogrens diagnosis– with my first Rheumy actually suggesting I try another MD after our attempts at treatment without diagnosis failed. The survey seems to assume that symptoms of RA are constant over time. Does it hurt to wash my hair? My answer is sometimes yes, very much, and sometimes no, not at all. If I feel pretty good at noon, don’t assume I’ll be the same at 9 pm or 6am, or vice versa. In my case, one of the multiple choice answers should be “sometimes”, or “it depends”. All of the questions have 4 to 5 options for always, usually, sometimes, rarely, and never. Sorry, did not meant to sound critical. I guess I was referring to the questions on washing hair and climbing stairs. Also, Thanks a million for all you do. I really enjoy your newsletters and other information. Some of those questions came from a standard questionnaire that’s been used by docs for about 33 years. I’m working on an aspect of the questionnaire that I’d like them to think about so, I included those questions and others on the topics. Men got 2 questions at the end that differ from women. It’s so hard to answer any questionnaire since none of us fit into a box neatly so I understand if it was hard for you. But I hear you and definitely am not one “to assume that symptoms of RA are constant over time.” I recognize that we all differ and that our experiences can change over time. When I tell people I have RA I hear that a lot too. They think arthritis is all the same. One finger with a bump or a knee from an old injury. I tell them that there are over 100 different kinds of arthritis, and RA is among the worst and that it is an auto-immune disease not a wearing down of the joints. It is all over my body and is very debilitating. It does need a different name just to help people understand. It hurts from head to toe and on the inside involving the organs as well sometimes. It can kill. Ibuprofen or Tylenol doesn’t touch it. I hear the same thing ..even my mother tries to “one up” me…Ive been diagnosed for 25 years now ..my son was diagnosed at 15..he is now 18..we have a bond that most people dont understand..i have friends that show me their fingers and say that theirs look worse than mine..when you fins someone that has RA it is a bond immediately…unless you suffer an autoimmune arthritis then its hard to understand…everyday is a struggle and it NEVER goes away..but we look normal! These sites and blogs help sooo much..its a lonely disease…thx to you all! I was diagnosed with RA less than five months ago (although I knew I had it for months before then….but I’m one of the RF seronegative ones. I am lucky in that I work in the medical field, so when I discuss it with my co-workers many of them are good listeners and know what RA is all about. It is shocking at times how many there are that don’t have a clue though. I find myself telling people, “Thank you for your response,” when they are saddened and sympathetic after I tell them about my diagnosis after having so many people respond as if I just told them that I had a sliver in my finger. Since I think that laughter is VERY important, I have a comment related to the survey. When it asks the questions about styling and blow drying your hair. There really needs to be an answer option: “It takes less time to style and blow dry my hair than before RA since the meds have caused my hair to fall out and I have so much less hair now! Thanks for mentioning that. I thought the same thing about going DOWN the stairs because of the fear of falling due to the times that I have tumbled. Loss of balance and ankle/knee strength, plus difficulty holding onto banister make it a huge ordeal. Can’t just run up and down the stairs – sometimes jumping every other step – with a basket of laundry, my laptop and a kid on my hip like I could 2 short (or very long) years ago. I think one reason why we come up against this wall is that healthy people look at us and are afraid. Afraid that if it can happen to us, it can happen to anyone – to them. So, as often happens when anyone gets sick with a serious disease, friends disappear and relative strangers minimize your pain. So good that you posted this, Last night a bad flare started and was unable to go to a speaking engagement I had this morning because I had to take pain meds to get to sleep at midnight so I did not wake up til noon. My mom tells me–you just need to go out for a walk and you’ll feel better. I told her I can barely walk to the restroom. Her reply–well it will just take you longer to walk. So hard when people do not understand what you are going through. I think we are so conscious of others feelings that we do not bring them into our pain because we don’t want their pity but they are not so conscious of our feeling and want to solve us. Can relate to everything in the comments, for instance our car which has an automatic gearbox had to go for repair friday, the car they loaned us is a manual gearbox with clutch etc, my feet, knees, shins and ankles are now very painful and i only drove maximum 15 miles, it even surprised me. I so miss being able to exercise and run or walk fast or even walk normally. Just wanted to congratulate Kelly on such a fab site and say how thankful I am to have found it. I was diagnosed with RA 22 years ago(aged 20), am on Humira treatment, have had my knees, shoulders and left hip replaced. Currently on waiting lists for 2 further replacements (right hip / left wrist)…feel like 92 rather than 42 most days!! … but like others have said here – the ignorance & lack of understanding from other people is still BY FAR the hardest thing to deal with. I have a neighbour ..in her late 70’s..just had her first knee replaced. She tells me how I only have rheumatism & how her arthritis is much much worse than mine!! Then there’s the work colleague who tells me all about her arthritic toes and the ops she’s had on them, how she’s also “full of arthritis” like me!… whilst tottering around the office in 4″ high heel shoes… how do you all deal with these people!? I’d love to hear ’cause it’s been over 20 years for me and I still don’t deal very well! Thanks for the the laugh, Julie. That lady in the heels sounds like it would be hard to hear from every day. I guess you try to laugh about it as much as possible. Some people might never get it, so you do whatever you can to make sure it doesn’t eat at you! It’s sure not our job to carry that around with us – we have enough to deal with from the disease & living our lives. I am 41 and newly diagnosed…August 29 of this year. My symptoms began around this time last year. Mostly in the small bones of my hands and feet. My mom encouraged me to see a rheumy when I got to visit her in June of this year. (I have a mentally handicapped younger sister who was diagnosed with juvenile RA in her early twenties.) I think knew I had RA although hearing it from my rheumy didn’t make knowing any easier. I have always been active-I was a marathon runner-note the was. My dream marathon was Boston and I am so thankful that I qualified and ran it in 2009. My marathon days are over as are, very likely, my running days. My only motivation for running now is that my 10-year old son is beginning to run a little to stay in shape for soccer. I want to run with him so badly. I do walk and use an elliptical trainer. When my hands allow, I also enjoy yoga. My rheumy-who I like very much-recommended tai chi and activities in the pool. A friend who I told of my diagnosis did some research and forwarded me this website. I read through it and became fearful and depressed. Today is my first visit since September. Yesterday, I walked in my local Jingle Bell run to benefit the Arthritis Foundation-always in the past I ran it to honor my sister but yesterday was about both of us. My friend walked with me and for me. Today I am sore and stiff from the walking(I don’t mind that kind of sore!) but the fatigue I feel is the real deal today. I have noticed the what I call ‘extreme fatigue’ more lately and also ‘sensations’ in my middle fingers, hands, and wrists at night. I am sleeping good at night, not sure if that is normal but I have always been a heavy sleeper! I am kind of living in the closet…for the same reasons many of you have also mentioned. Shame, fear, rejection. I am currently going back to college to be a teacher. Like another post I read, I am also quiet about my RA because of my future employment. I do not want it to be held against me. I do not know what exactly I am in for as RA will affect us all differently. I have told those near and dear to me and received good support, although I think they still do not really understand. My husband has been awesome! My son calls me his ‘little AR’-don’t know why he wants to reverse the initials! But it is cute! I appreciate all of the information on this site and for all of being brave in sharing your experiences. I am scared…I am trying to be brave. By the way, I can walk up the stairs but down is harder, I can wash my hair but it can be a little bit hard to style, I also cannot open a water bottle. I carry a Klean Kanteen and can open that with no problem, but a plastic bottle is out of the question. I am also wising up to giving myself more time between busy days. This season is going to be very hard!!! How do you adjust to doing less when you are used to doing everything? And like doing everything?! What I tell people who are afraid like you said, is to know it doesn’t usually stay the same or stay at its worst for most people. You will adjust and find good doctors as needed and hopefully medicines that work for you. You will be able to accomplish a lot, even if it is sometimes modified versions of what you did before. I hope you can run with your son. I long to run too and I’m determined to find a medicine that will help me so I can run. We can also always hold out hope of remission since we see it does happen. Another thought I have is to talk with someone to help you through the grief and fear. If you have great support that might be enough or sometimes a counselor is a big help with this. We all tend to push ourselves to the limit or passed it like you did with the doing the arthritis walk — It is not necessarily an unhealthy approach since we do want to fight to hold on to as much of our lives as we can & have those victories. I hope you can continue to have great support & find the balance in these things that is right for you. It is a blessing to like doing everything and as another person with that nature, I can tell you that you’ll also find new things you like to do to replace things you can’t do. It’s your nature to enjoy life & you will. I hope this helps – lots of backspacing typos but I wanted you to know someone is listening. Take care of yourself. I’m on Humira injections fortnightly, MTX injections weekly and 8mg prednisone daily. On that regimine, I can do some yard work, walk up some stairs and do some chores etc – nothing like what I could do before RA, but enough. Good luck to everyone out there – especially to those for whom no medication seems to work. yes, I understand, Craig. That’s how these tests are answered – based on how you are even on meds. You’re right it doesn’t seem completely logical or fair since so many of us do not have a response to meds, but we have to measure or compare somehow – and we do eventually want to find meds to work for all – so this is how we measure. Very good point tho about 7 versus 8 mg of prednisone!! I was diagnosed with RA a few months ago, but I’ve had pain, fevers, and fatigue for seven years. I am on methotrexate and prednisone now, and tramadol for pain. I feel better, but not perfect and there are days that I feel like my brain isn’t working right. I get fevers for no apparent reason. Lately my head and ears have been hurting. Is it possible to have RA in your skull? I want to be active, but I feel like after work, I need to rest. I get cranky because I’m uncomfortable. I’m only 31 and I don’t have any joint deformities or anything like that, but I am afraid that I will be disabled before my time. I don’t know if I should tell my friends and co-workers and bosses about my disease or not. I don’t want to be seen as whiny, but I feel like it may be affecting me at work. I know it affects me at home. Dear Alley, You asked if RA can affect the head (skull) and the answer is yes. Unfortunately it affects every part of the body in some of us. I have had RA for over 30 years and am headache prone since childhood. Sometimes it feels like my brain is inflamed. The best pain med I have found is called: Butalbital/APAP/CAFF/COD 30 MG CAPS. It helps headaches and also pain throughout the body. I took Vicodin for the first 15 years and all it did was cause headaches and make me feel sick. This one in capsule form really does help the most. It has Tylenol, caffeine, and codeine in it. In the morning I find that it works the fastest with that 1st cup of coffee. Comfort time for sure for a little while. This is not the usual pain med. the doctors recommend and you have to ask for it. It is easy to swallow because it is a shiny capsule and not a powdery one. It doesn’t bother my stomach but always take your meds with food. I hope you feel better. As far as your skull, there are some possibilities you could look into. The base of your skull is a critical joint with your spine & it is common for Rheumatoid disease to affect that. There are several possible symptoms including neuropathy or headache, depending on where the inflammation is. Also, there have been many patients who have complained about inflammation in the ears. I don’t know if it is the tiny ear bones as some suggest or possibly lymph nodes in the area. But yes, we have heard a lot of patients complaining of ear pain. How much to tell your work associates is a hard one and the best thing I can tell you is take it one day at a time. Maybe one person at at time. Also, if you do decide to discuss it, maybe be prepared with some awareness materials or a letter from your doctor in case they doubt you. Like you said, many of us do not have “obvious” deformities while we still have disabilities. forgot to mention – about the skull pain possibilities – It could also be the jaw joints. Something else to look into. I found myself nodding and smiling at all the comments (although it’s not funny) – you all read my mind :). I’ve also stopped talking about it, unless someone specifically asks after my health (you can spot those who are really interested). It hurts when family keep on saying “you might not end up disabled or get heart disease etc – so why do you carry on about it?” or my all time best – “you are taking this way too seriously, you’re making yourself worse”. Diane, I’ve had that same funny experience meeting many other patents – they do look ok too, like you said. And we’ve talked about it at times. It’s hard to overcome what we think healthy looks like I guess. For the past 30 plus years or so I guess I looked like I was ok but suffered with all the different pains and disabilities of RA, but now I am looking like I am sick. People are noticing the dark circles under my eyes, weight loss, the deformed hands and are asking if I am ok. I don’t know which is worse. I feel so depressed at the hands being so ugly and nothing I can do to hide them except wearing extra long sleeved blouses or jackets. Some have said witch hands are something they don’t want if they get arthritis. It is embarrassing when people stare. When I am eating with others it is so obvious because I can’t cut my food and can’t hide my hands. This is my saddest thing dealing with RA. I can figure out how to handle most other things I have to deal with including the pain and not being able to do things the way I used to. I too, find going downstairs more difficult than going upstairs. I tend to either lean on one wall, or place my hands flat on both walls and push slightly against them as I step down. I have found one explanation that does seem to turn the light on for folks so they can understand RA pain. I ask them to remember what it felt like when they hit their thumb with a hammer or caught a fingertip in a drawer or door. I then tell them that the pain caused by blood pooling under the nail is like the fluid build-up between joints during an RA flare. Honestly, when I use that description they really get it, every time. I was only told 2 days ago I had RA. I have known it for 23 years, but docs would look at my hands and say go home. No blood work, etc. I told my brother today, HE was like OH, we all have that…I said no you don’t. At least if you have SLE or MS, people respect it… I’m not going to try to educate the world at this point .. I just want to make 69, to see my now 7 year old turn 30.. am I crazy in thinkging that since the diagnosis was made I feel worse, more tired.. more achy? I was diagnosed with RA two months ago. After years of pain I changed doctors and my new doc sent me to a rheumy straight away. When I told my boss she said “oh, in other words nothing” I was speechless and so were my work mates. Later on she asked me about it and I filled her in a bit but really couldn’t be bothered! This site has been my sanity saver, just knowing I’m not alone or nuts is a big help. I still go to work but am exhausted when I get home. I am very stubborn and will continue to do things when I shouldn’t – like cooking stirfry when I can’t hold the spoon properly! My hubby is brilliant and recognises the signs and just takes over, while giving me a lecture at the same time!! I am 50 and newly diagnosed. First Rheumy appt on January 4th. I have said this before but I just can’t get over how quickly this disease attacks. My symptoms began around 2003 after I lost a baby, my sister to cancer and the following year my father from heart related illness. My symptoms began as exhaustion and rashes primarily on my hands and upper body especially when in the sun. The HMO I had at that time said it was severe stress and diagnosed me with depression and after blood work Polycystic Ovarian Syndrome. The exhaustion was just nuts like I was hit by a train and the rashes made me begin to look into Lupus but RA and ANA tests were negative. My left hand was the first place I noticed pain after gardening my right hand followed and then somehow I went into a remission with what I called “the mystery disease.” However, minus the rash and exhaustion I did begin to have pain in my left big toe joint like I was getting a bunion but the bunion never formed I do have what looks like a ‘corn.’ Also, both my wrists have begun to ache and where my wrists and thumb joint come together tends to ‘click’ and get stuck when I grab something. When laying in bed I noticed that I would get stabbing and burning pains on my left foot. My hands would tingle and fall asleep for no reason when I woke in the morning-but still no exhaustion or rashes. The last year with symptoms was 2008. Well, Thanksgiving evening after the guests left (we hosted and I spent a few weeks decorating the house and cooking–stress related?) the rash began and I knew I was in trouble. The rash this time was mostly in between my fingers and on my joints of my hand/fingers. Oh boy did it itch. Then that night my right shoulder was killing me and it moved onto the left shoulder as well. My lower back which has been making a crunching sound lately hurt and burnt wrapping into my left hip which later went into my right hip. So, the next day I was exhausted and pain in both shoulders, hips, wrists, hands, ankles and feet. Today, December 26th it’s mostly in both knees and left hip. I saw my primary doctor a few days after Thanksgiving and he after listening to my history–I’ve only had him 2 years so he has never seen me in a flare nor heard of my symptoms got on the phone with a Rheumy he knows while I was still in the office and got the blood work ordered that the Rheumy wants so he will have results by the time he sees me. My temp was 99.9 and I told him I often get that and he told me that is not normal and now we probably know why my C Reactive Protein has been so high in the past allergies was to blame we thought. My internist diagnosed me with RA and got me on Prednisone and vicodin with Motrin for pain. I must say it has helped but now that I am down to one prednisone a day the pain is coming back. My test results were normal except for red blood cells in the urine. When I go to the Rheum. I am taking all of my past CRP tests so he can see how high it used to be for several tests. My Endocrinologist has me taking Simvastatin for cholesterol and that has lowered my CRP to normal. So, I am thankful that my internist acted so swiftly but I have been waiting a long time to see this Rheumy in San Mateo so I hope he is worth the weight. I’ve heard he has no bed side manner but gets the job done and that’s what I want guess I am just scared he is going to tell me it’s all in my head. I rambled on but had to get it out. So the old me: enjoyed gardening, cooking, bicycling, hiking, camping, professional dancer/choreographer. Now I’m sitting here with a hot pack on my back exhausted contemplating taking a pain pill. I have not had one today. What to do, what to do? Dear Kristina and others who are newly diagnosed: read the comments on Kelly’s blog. you will learn so much! It will help with depression to hear of so many brave stories. Also I recommend Mayo Clinic’s page on RA and other autoimmune diseases. It seems like the more you know, the easier it is to deal with the disease. I am in medicated remission with a half dose of methotrexate, monthly orencia infusions and low dose prednisone. i can kayak and play guitar – 2 things i give up when i am not helped by my meds. the drug routine the rheumy’s use is to follow a protocol. my docs started with methotrexate, then cimzia then orencia – this is working (with prednisone) let’s see what happens as we lessen the pred. i am anxious about that. a double edged sword is the weight gain with the drugs. i count calories so i don’t have to starve yet can eat enough to feel good! low fat, meats and sugar helps. don’t eat out much. msg, in all restaurant food, can aggravate the symptoms (esp if you are an “allergic” type). read your labels as well. concentrate on how you feel and on gaining knowledge. lighten your load so you can rest freely. when i rest, i really rest – it is very effective. i go to bed by 7 pm many a night. although i may not sleep through the night, i am in rest mode till daybreak. then i go about my day accordingly (based on how much or little pain i am in). it would take 2 paragraphs to describe how active i was as a type-a personality when this disease hit. it takes awhile but if you take it on as a challenge – a “project” -you can rearrange your life accordingly. good luck and stay glued to kelly’s blog!!!! thank you kelly! Thank you Cecelia, I love your positive attitude. I’m newly diagnosed and I’m learning to pace myself and rearrange my life accordingly. I’m still getting my head around this disease and this blog is my sanity saver! Hope you have a happy new year! “why do you look so sick and upset.” I explained that I was in pain and tired-even thought I just woke up from sleeping eight hours. Do men go into denial when their women are sick? Maybe it’s a man thing. I was waiting to go into detail with him after I see the Rheumy on the 2nd. I wish he would go with me but he has to work. When I go to any doctor anymore with a complaint they don’t seem to have an answer. Am I the only one? Side effects from the infusions that take place the next morning are denied as side effects saying they don’t know what it is for instance. I just went through a whole year of side effects from Reclast and Rituxan combined. Between Dec. 2011 – 2012 I had diarrhea and inflamed fingernails. Lost 30 lbs almost right away down to 100 lbs. I saw several doctors and told them and none admitted it was due to side effects. Are they afraid of law suits and not treating the patient? I don’t want to sue, I just want help and don’t want a lot of useless expensive texts that don’t do anything to help. They are repetitive and expensive. Then the doctors always tell me there is nothing they can do to help me. Just pain meds. I get so discouraged. I have had RA for over 30 years and they say it is to late for me. I wish I could get my hands rebuilt and workable. That is my biggest wish. whole emphasis on the “people don’t understand me” angle. about them, it’s about me and how I can cope. I think you misunderstand in assuming any position I take on this blog is a result of personal situations. One of the 3 goals of this site is to increase awareness. The lack of research and the misdirected research over the past 50 yrs has resulted from lack of understanding of the disease; also the lack of research dollars in the US is a direct result of lack of awareness. While you and I may not care if people do not understand us, there are more important reasons for awareness such as accommodation, proper medical treatment, and research for a cure. I hope you’ll read my upcoming book with many documented reasons awareness will improve lives as well as medical knowledge. Well I want to be healthy and productive and not a ‘Debbie downer’so I smile and put my best foot forward – literally!!!! I don’t share with people I understand to be heartless frankly. Plus the days I’m walking like a crab or can’t lift my arms I stay home. So that’s why I get the ‘you look great /fine or whatever.